I enjoy gardening but have only a porch for my plants and herbs. For years I’ve been growing fresh basil, oregano and assorted herbs and vegetables on my porch each summer. 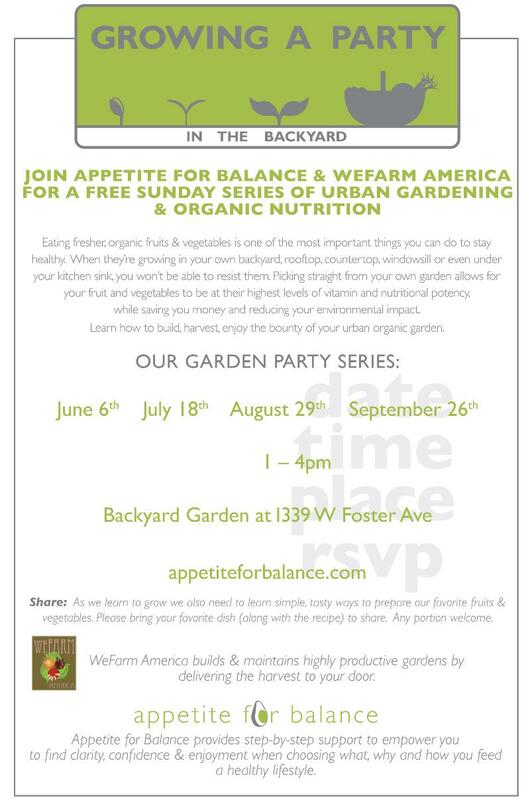 If you want to grow your own urban garden but are not sure how to get started, you may want to visit an Appetite for Balance garden party. If you missed the party in May, no worries, they are holding four more parties this summer! Read their flier below for more information. All parties offer give-a-way(s), gardening tips, food demos, holistic nutrition/wellness, hands-on workshops, sustainable food/beverage, and FUN in the sun! So, grab a friend (or two) for a Sunday afternoon of digging and chewing!